Celebrities hunt for antiques across the UK. Charles Dance and Geraldine James join experts Natasha Raskin and Will Axon on a trip round Wiltshire. Browse content similar to Charles Dance and Geraldine James. Check below for episodes and series from the same categories and more! Charles Dance and Geraldine James. So, when did we first meet, Gerald? I think it was 1981...or 2. When we started Jewel In The Crown. of the British Raj in India, The Jewel In The Crown. -I'd been in Gandhi the year before. -You were a team leader, weren't you? -I remember, "Now we're going to go down to Janpath. "of the Imperial Hotel and have tea." But we were very lucky to be there for six months. -It gave us time. We saw so much of it. 14 hours of high-quality film. to classy, period pieces, and even the odd iconic comedy role. starring in the recent Emmy award-winning series Utopia. Her CV is simply stacked with too many goodies to remember. What was that play we did? he too has played down the years with impressive range and bearing. with skill and relish to delight audiences everywhere. as the tyrannical Tywin Lannister in global megahit Game Of Thrones. Today, these two are driving a marvellous 1965 Mercedes 220.
and hence they aren't buckled up. Got it? -It reminds me of my wild youth. -Not having a seat belt. Did you have a wild youth, Gerald? -You weren't thrown out of school, were you? -My father refused to have me home, so they had to keep me. Will Axon and Natasha Raskin. It's nice to meet a thesp, isn't it? Do you think you'll refine your accent a wee bit? Because I'm already doing it. Don't give the day job up, Natasha. These two are piloting a 1970 Triumph TR6. Oh, you're handling this Triumph beautifully. -Thank you for saying so. and aim for an auction in Rayleigh in Essex. -off to spend some money. What is happening? Oh, my days! What have you done? I was saying you were driving it so nicely. -Hang on, I'm going to open it. He's brilliant, isn't he? OK. Time for some shoe leather, I think. You lead the way. I don't have a clue how to get there. It wasn't me. Believe me. and the latter is nabbing the only remaining car. I'm going to have to try and blag some alternative mode of transport. -Will, I feel so sorry for you. This car is lovely. I'm sorry, Geraldine, to turf you out. Come on, then. We'll walk in their tracks. I've known Geraldine for quite some time now. In fact, honestly, she's one of my oldest friends. She's the most delightful woman. ..while Geraldine and Will are rather stuck in port. Yes, but we can't just get in a car. generous Jag owner Peter will give them a lift. They're finally on the road. in the town of Tetbury and are ready to shop. Hoping it lives up to its name. Are you ready? Well, as ready as I'll ever be. ..where dealer Julian will greet them. -Aha! Nice to meet you. and have a good fondle? I'm going to get this open so you can fondle in here too, OK? I knew we'd come to the right place. -An awful lot of fondling is going on. First they're going to scour the place. Look at that hat box! It's wonderful. It looks wooden. -Let's see. Is there a hat inside? -It would be so nice if there were. No. probably dating from the 19th century. so that's piqued his fancy. It's a quirky thing, isn't it? It is, isn't it? You're absolutely right. Cool! They're off to a good start. But what's that Charles has spied now? These are just blocks of silver, then? Just blocks that have been hallmarked. But then... Then again, I'm just an actor. An actor with an eye for antiques, Charles. It's an engraved silver ingot, hallmarked for 1977. Polished up, they're rather pretty things, aren't they? I'm going to talk to Julian about them. You do your stuff. I can't wait to see you in action. -I'll talk to him now. I reckon we'll do it for £18. I was hoping you might do it for something like 12. 12! So, £15, we have a deal. -Thanks, Julian. Thank you very much. -Thank you very much, Julian. That's their first buy sealed. This has all the hallmarks of a promising day's shopping. in generous bystander Peter's Jag. We have landed on our feet. Peter, you're very kind to give us a lift. in dark conspiracy drama Utopia. I mean, Utopia, it was an amazing piece of television. I'd be interested to see how you, sort of, saw it. It was extraordinary. For me, it all starts from the script. I read that and was completely hooked by the writing. It was so unusual and so mysterious. All that is great. It's really good fun. their first shop's ample stock. All manner of things in here. But what's this Charles has alighted upon? since the Battle of the Somme, 1916.
of combatants in the First World War. Charles is intrigued by it. However, let us see what Natasha thinks about it. Well, have a look at that. OK. The Great War Press Cuttings. but there are these photographs. might be commercially produced reprints. The book probably dates from the inter-war period. we'd have to do better than that. Charles is revealing himself to be a bit of a bibliophile. ..but it looks as if it might be rather lovely. by American poet Henry Wadsworth Longfellow. This limited edition was published in the late 19th century. Aesthetically, I think that's really rather beautiful. as a piece of book design, it's really rather lovely. I bet this is probably an eye-watering amount. Again, I'm going to talk to Natasha, I'm afraid. -Are you familiar with that name? -No, I'm not, but I hope you are. Paintings like La Belle Dame Sans Merci. in a kind of Pre-Raphaelite style. She knows her stuff, doesn't she? and the bicorn hat tin they saw earlier. So, with their heads set on a hard haggle, off they go to Julian. Ticket price on all that is £173. ..and I'd like some change from 100. Oh, my God! Now, that is hard work. and re-working and shaving and chipping and re-doing and re-adding. How about 115 and we leave the shop? 120 and we do a deal now. Go on. Thank you very much, thank you. I could keep lunch in there, couldn't I? and Geraldine is filling Will in on a little of her family background. My parents were both in the medical profession. They met in a hospital. My mum worked at Guy's during the war. the Mechanics' Institute of Swindon's Railway Village. chair of the Mechanics' Institute Trust. of the Great Western Railway. Was this all Brunel's idea? that we see today and all of these buildings around us. It was the GWR that brought the workforce to Swindon. The railway brought the people. to work in the railway works, they needed somewhere to live. They needed facilities and recreational opportunities. were soon under great strain. but there just wasn't enough supply of housing. it was a pretty dull place and wasn't a very healthy place, either. that saved the place and turned Swindon into a success. for the benefit and enlightenment of those employed by the GWR. for New Swindon to become a thriving community. were all eventually provided for the workforce. Who funded all these community endeavours? The workers themselves came together. and governed the organisation of the building. -Did they have a theatre? The theatre was upstairs in the Mechanics' Institution. You can see it here today. It was built in 1854. And that was really the centre of Swindon social life. but there are proposals to redevelop it. to the Swindon works employees. that had never before been enjoyed by ordinary working people. So, all these little rooms, what are they? Are they different treatment rooms? and the Turkish baths, but also a range of medical care. -and there was also a range of other therapies. to the Medical Fund Society through their wages. its architects knew just where to look. for a National Health Service. and this building is still caring for the people of Swindon today. that kind of thing, along with just people going for a swim. Here we are - Cirencester. Change here for Moscow, Stockholm and Paris. OK, you ready to buy some more stuff? And they're straight off and browsing. Is that a wee frame? Oh! It's a cute one for all the family. -That's rather nice, isn't it? and has a ticket price of £42. Hmm, we really want it for about 15-20. We do, darling, we do. But what has Natasha spotted now? maybe we could add a little bit of trench art to it, perhaps. on the battlefield, like these empty shell casings. -So, they're quite naive and quite sweet and genuine. They are, at £18 the pair. but there's another battle coming as Will and Geraldine are here too. And look who's waiting in the wings. Look at him. Look, he's found something, he's found something. Let's say hello, come on. Let's go and wind them up. -Are you staying upstairs, are you going downstairs? Yeah, we've done downstairs. Have you been...? We'll go downstairs, then, in that case. That's a terrible limp you've got there, sir! I know, it's such a shame. He's had it all day. He did have something behind his back. You two'd better stop spying on the opposition and get browsing. See, that's a very interesting pattern on that. I've never seen that pattern before. You do know your stuff, Geraldine. Impressive! -It's quite pretty, isn't it? -It is quite pretty. It's £8. Shall we leave it here? Yeah, hide it behind a plate. Why do I keep honing in on this stuff? Is it just cos I know it? -Well, I think we've got to buy a piece of Devon pottery. this one made in the Devon town of Dartmouth. They're building up quite a haul, these two. But elsewhere, Charles and Natasha are still on the hunt. Is that some sort of...? Is that not for tickets on a bus? -Is that a conductor's ticket machine? and I guess it goes like that and out comes your ticket. and there's £69 on the ticket. There's the ticket thing, look. -Oh, look, it even comes with a spool of paper. Now, that's got my juices running, OK? and the pair of trench art vases in mind. Shopkeeper Will intends phoning the three dealers. First on the blower, Nicky, who owns the £42 picture frame. And I'd love to know what your very, very, very best price would be. All right, that's a deal. Thank you very much, Nicky, thank you. -She must like you. She doesn't normally go that low. Oh, how good is that? with a ticket price of £18. What's the very best you can do for that? How about half price, nine quid? Is that Raj, did you say? No, you're speaking to Charles. Charles Dance, my name is. Thank you very, very much indeed, Neil. How good is that? Well done, Raj! Yes! Yes, "Is that Raj?" Now, what about the ticket machine, which had £69 on its own ticket? Can I make you an offer? Somewhere between 35 and 40. You're a gentleman. Thank you very much. Charles's mellifluous tones make that a phone haggling hat-trick. We have got quite a swag bag, Charles. but Geraldine and Will are still on the hunt. Listen to Charles Dance down there, bartering away. I can hear him, you know. I DEMAND I have this for nothing! I think he's enjoying himself. that I should have committed my cash. -Yes, I do like silver. I remember, in India, all the silver jewellery. perhaps we could go with that. It's a little silver embossed box with a ticket price of £78. I've dropped the price, just like Brian's going to. Put that to one side for us. -And we can always battle it out. but elsewhere, there's one more exotic item. -That's quite nice, that architectural carving. Mind your back. Mind your head. apparently hailing from a Moroccan riad, ticketed at £110. Please stop picking it up, you're going to hurt yourself. Well, I'm just having a look at it. and let's see if dealer Brian can lower some prices. First up, the West Country pottery, ticketed at £41 combined. The very best, how about 30? That's quite good, isn't it? -It's not quite as good as 25 would be. -That's not good, that's naughty. -That's not good for you. you've got behind the counter, didn't we? Yeah, I kept that for you. -In the catacombs I found this one, a lovely Chinese one. -And it's fine work on that. That's a better finish, isn't it? Yeah, more refined, better quality than perhaps the Indian piece. I like the feel of that better than that. -Do we have a price on that? There isn't a price on it, which is slightly worrying. That one's 85, but I can do it for 60 for you. so my part of the bargaining, I'm going to say yes at £60. and owned by a dealer off-site? but that's a big ask. That's a big ask, isn't it? £50 is a big ask, isn't it? Oh, wow, he's in a very good mood. Let's go for it. We've got to, really. Will you thank him very, very much? Geraldine says thank you very much. but Will's got other ideas. So, can we say 130 for...? -This man has been a godsend. And they've got everything they need in this shop too. Well, we'll revert to type now. You pay the man and I'll go and get the heavy things. on this road trip. Nighty-night, darlings! But these players are such stuff as dreams are made of. The morning greets them on the road and ready for more. I felt like a kid in a toy shop. I absolutely loved it. You? Have you bought anything that might be a tiny bit risky? I think it's ALL a tiny bit risky! You catch on quick, Charles! and in a replacement car. Is that a 1970 Citroen DS20 I see? Well, Will, bien fait, well done! Where did you come across this French beauty? the bus conductor's ticket machine, and the little picture frame. They still have £191 left to spend. and the two pieces of West Country pottery. They still have £270 in their pockets. Oh, they look cool, don't they? Where exactly did you get that car, Will? making the Arnold Schwarzenegger movie The Last Action Hero. -about European art films, do you know? "to make your art films." He said, "You're absolutely right, Arnold." And talk has turned to Hollywood in the other car too. I did a film, a small bit in a film with Morgan Freeman. -And I was beside myself. -I was playing his lover. And we had to have a love scene in a pile of hay. This morning, these two are driving to Bath. and they are strolling off to Bath Antiques. How do you do? I'm Geraldine. Niceties concluded, time for a plan. Shall we go round together or do you want to split up? No, let's go round together. -You shout if you see anything that catches your eye. We don't know what we're looking for, do we? We just want something that we like. Something to jump out at us. What's this big old thing? Will seems to have lost Geraldine, but what's he found? really just because it's big and impressive. But just trying to ascertain if it's got any age to it. Well, there's plenty of dust. any wear on the foot. It looks to have a little bit of wear, you know. I mean, it's a big, impressive lot. It's got a big, impressive ticket price too - £95. Not signed anywhere, though, that's a shame. -Oh, I was looking at that early on. It's obviously got a little bit of age to it. and then you've got these little air bubbles caught in it? Time to talk money with Annette. Stand by, girl. Well, I've gone from the cellar, right back upstairs. -And right back down again? what I think is a rather nice glass centre bowl. -..so it's obviously been there forever. for as close to £20-£30 as we could. The vendor, Gill, isn't here today. so over to you, Geraldine. and we're rather struck by your green glass bowl. -..if you're prepared to accept 25. 'So I would say, 28 and a half, you can have it. -I'm not faffing around with 50p. Is that all right? Thank you, Gill. An incredible discount on the dusty green bowl. I'll do the honours and carry the piece. -Very nice to meet you, thanks a lot. -Thanks very much for your help. for their first shop of the day. I've got you at my right hand and I don't think we can fail. but what are they going to find here? Right. The object is to spend money. Indeed it is. They're meeting dealer Laura. Hello. And with that little sweetener, they are on the hunt. Intriguing, but who wants to buy it? Ha! There is one thing that has made an impression. I haven't looked at the label, so I've no idea what this is. with a wooden top added. The cast-iron base is Victorian. I think it says 1890s, Charles. You've forgot your glasses. everything would be 50 years older than it was. I know, Charles. The cheek. Do you like it at 349 quid? No, I don't. But I like its style. and the fact that the Victorians just cast everything in iron. But more importantly, do you have faith that it will sell? -Yes. I mean, it's a cool thing. Oh, for sure it would sell. That hefty ticket says it's owned by a dealer called Debs. What man or a woman is Debs, Laura? -Oh, that's Debs! That Debs, that Debs. And while Laura has a confab with her mum, they search on. -When is a door not a door? Oh, the old ones are the best, Charles! And this pair of hallmarked silver vases have some age too. OK, let's have a look. These are typically Edwardian. You have a look at that one and I'll have a look at that one. These are not rare. These are stylish. -and I'd be looking for you to work your magic. Laura will try to contact the dealer who owns those. But they've two pricy buys in mind and only £191 left. It turns out Laura's mum, Debs, is in fact nearby. Very close by, but hiding, yes. Could she come out of hiding? Can I have a word with Mum? -I'm sure you can. I shall go and see if I can pull her out. and you've scared her into hiding! No, I haven't, not at all. -She's out there making herself a cup of tea. -Treat it as a role. Lull her into a false sense of security. not a false sense of security. -I'll do my damnedest, anyway. -Hello, Debs, how are you? -I'm Debs, pleased to meet you. How very nice to see you. Time for a chat about that bench. Debs has priced it at £349. I'm being really cheeky now. Go on, then. Try me. Can I have that for 85 quid? You never straighten your hair, I hope, do you? -Well, do you know, so many women do. getting the fantastic waves out of their hair, and you don't do it. Don't ever straighten your hair. I think that might have worked. He is good, isn't he? So, can we shake on 85 quid? -I owe you, all right? -..you are indebted to Debs. Thank you, Debs! Very kind. But now Laura's got the dealer who owns the silver vases on the blower. Hello, Heather, it's Charles Dance, how are you? in our hot little pocket, you see? Am I pushing my luck to offer you 100? You're an absolute angel, Heather. and thank you for being patient with us. All right, my darling, thank you. means they've spent all but £6 of their budget. I'm in complete awe of you, Charles Dance. Back in beautiful Bath, Geraldine and Will have just finished lunch. All right for some, eh? -Hang on a minute, what's going on here? in the middle of the street. So what was the plan with this? Well, I was going to put it in the office. We've got an antique office... The antique office. -It's an old office, but it's packed full of antiques. And this works quite well in there, but unfortunately, it won't fit. This sounds like an opportunity. ..seems to be going begging, rather. and we are looking for things to buy. Jeremy here has got this grand beast from a dealer nearby. But since then... Which was quite good! I think there's a little bit of live woodworm. What do you reckon? We could help this man out, couldn't we? Well, we haven't quite got anything like 700. We haven't got 700 quid. Would you take 230 for it? -Yeah, go on. Saves me packing it back in the van. ..French Empire stuff anyway. So, go on, then, go on. 230. A most unexpected alfresco buy, or al-desko buy. Oh, look. I've actually left myself a tenner. -But I need that for this afternoon. Check your pockets, Will, you actually have £12 left. I'm not sure I just did that, did we? Charles is filling Natasha in on his childhood. I was brought up in Plymouth. I was brought up by the sea. It's very much part of my blood, I need to be by the sea at times. I actually thought about joining the Navy. -Look, they saved a space for us and everything. ..where they are meeting curator Dave Morris. and Charles, for one, can't wait to find out more. Tell me, how and why did the Navy take to the air? of looking over the horizon. the Navy starts to become interested in flying. The aeroplane comes along in 1903.
and the Navy takes an immediate interest. even begin to think about using it for search and rescue. The plane behind them is a very early example of a naval aircraft. Did a plane like that sit on the top deck of a battleship? quite a lot of metres to take off, doesn't it? in a very short distance. -I don't like the "just about", do you? "Well, you can just about take off..."
they quickly began to develop more advanced technologies. aircraft are now needed and being used, of course, for war. This is the beginning of World War I. And straight away, lots of things are changing. It's got more purpose, it's got a better engine. The whole design has become more compact. Yeah. And these floats mean that it can land and take off on water? Aircraft changed the shape of warfare as we know it. look down, attack from above. I mean, it put a whole new dimension, literally, into warfare. the Navy's air fleet would continue to make brave leaps forward. developing Navy helicopters, like this one. we got this as the new technology, the new helicopter age. -Am I allowed to get in there? There's not a lot of room in here. Have you got the key, please? 40 minutes south-west to the village of Ston Easton. Let's hope all is joyful as they aim for the next shop. The Somerset Shop And Reclamation looks interesting. -Slightly wish we had a bit more money. Quite. You've only got £12 left in your kitty. -How do you do? I'm Will. -Hello, Will. How are you? I'm John. You're a small lad, aren't you? Around 6'4", if you were wondering. Very nice to meet you, what an amazing place. What an amazing place you've got here! you are spoilt for choice. And what's this? than the one you picked up yesterday too. Look, don't even ask how much it is, because we'll only be upset. But that's interesting, isn't it? and I love reclamation places. But I think this will need a little bit of a...sort through. How about a nosy outside? Oh, yeah. They can be quite fun. People use those as doorstops. Yeah, we've got some more of those in the showroom. provides a stable block for when nailing on a sole. -So we've got those there. I think my arm's about an inch longer from when I picked it up. Well, that's definitely the most interesting one. I was just thinking as a doorstop, something like that. Slightly industrial sort of look to it. Some of the original paint. So they are 12 quid each, normally. Can we do two for 12? Hey, that's buy one, get one free. Um... I think I would, yes. -Well, you're a fantastic person. let's shake on it and I'm going to say thank you very much. single penny of their £400. Congratulations. -That's the last of our funds! -Thank you, John. Very nice to meet you. -All right, grab that one. And I'll grab... Always left with the heavy stuff, aren't I? -But you're so good at it. to take a peek at what the competition's bought. OK, let's do it. Shall we do it, Charles? -Right, you get that end. Two cloths. Worn by Napoleon. Just the hat tin, not the hat included. Well, it's all very prosaic. I think it's a lunchbox. -It would make a fine lunchbox. It would, wouldn't it? Be a good lunchbox, that. -Has it got anything in it? Does it open? It opens, but, unfortunately, there's nothing in it. I reckon you paid 20 quid. OK, times that by three! Charles, take the lead on this one, because you loved it. Well, this is trench art, right? OK. Made from old shell. Empty shell cases, from the trenches. -What did you...? Oh, trench art. Well, it says an album of press cuttings from the First World War. No cuttings, but there are these photographs. -The First World War, from the trenches. And that's a bit of trench art. -And that kind of goes with it. -It does go with it. -Time for act two. Curtains up. we bought that off a couple of blokes in the street? -No, I wouldn't believe you. We just happened to be in the right place at the right time. Then the little bit of export Chinese silver, snuff box. And knowing your luck, 50p or so? Not quite. It was 60 quid. See you there. Good luck, Natasha. -I don't know if I do. What do our thespians really think? Time for some backstage gossip. I think we've got them rattled. -Did you see their faces when we revealed the cabinet? -They thought it was a set-up! Two guys in the street? and they get a piece of Empire furniture! and the town of Rayleigh. -I'm intrigued, a little trepidatious. -..is going to do very well. don't you love it? - also on six lots. thinks of what our actors have acquired. The silver vase is Edwardian, very nice. The Chinese box, the star of the show. It's a fantastic box, plenty of interest. Time for our teams to take centre stage. Indeed. We're starting with Geraldine and Will. Is there a calling for Moroccan hardwood lintels in Essex? Commission bid's at 20. 22, 25 against you, sir. 38, I'm out. At £38 at the far back. All done, you're all finished. Not quite the flying start they were hoping for. Listen, things can only go up. -I thought it was going to go for far less than that. How about your next lot, Geraldine? At 120, here with me. 130 online. 140 is bid. Surely someone in the room. 200 against you. 200, 210, 220. Back online. 230 is bid, at £230 in the room. At 230, 240 is bid. -Internet is back in at £300 now. One more, sir. Don't lose it. 310 now. 310 is bid. 310. All done, all finished at £310. First profit of the day. -We made a little bit. Next, Charles's agricultural bench priced originally at over 300. At £20 now. Thank you, sir. 22, 25, 28, 30 against you. Internet is coming in. £30 at the back. 40 anywhere? £38 coming in on the phone. Against you online. 42 is bid. 45, coming back in online. Thinking about it. 48 is bid. 50. Internet, 55, thank you. 55 is bid. Savvy buyer on the net. One more online. 65, thank you. I'll sell at 70, fair warning. Last chance then, please, at 70.
and trench art vases together as a job lot. At £20, advance if you wish. 2, 5, 8, 30 bid now. -38, 40 bid. At £40 now. One more, sir. At £40 now. It looks painful. At £40. -It's a loss, it's a loss. What can these cobble together? Oooh! £10 is bid. £10 now, at £10. Where's the 12? At £12, now. 12 is bid. 14 now. 14 bid. Shaking his head. One more. 14, 16 bid now. Second row bid. Are we all done at £16? A few more like that, Geraldine. Now, what can Charles's 1960s ticket machine do? Interest straight in at £20. Bid at 20. Advance if you like at 20. Internet, 22, 25, 28, 30 bid now. Come along. 32, 35, 38 is bid. Commission bid's at 40 now. 60 is back with me. At £60. It's a commission bid. Are we all done? Are we all finished? That's the ticket. A healthy profit there. Geraldine's job lot of West Country pottery is to go next. Commission bid I have at £10. 10 is on the commission. 12 anywhere? It's here with me at 10. 10, 12, thank you, madam. One more takes you. No. £18. My commission bid, then. Last time then at 18 on the commission. Job lot for Charles now. Evangeline and the wooden photo frame. It's here with me at £40. Advance if you like. It's a maiden bid at £40. 42, 45 is against you. 48 is bid and 50 now. At £60 on the commission, at £60. Are we all done, are we all finished at £60? He is slowly catching Geraldine. It's fantastic, it's in great condition. Next, Geraldine and Will's big green glass bowl. Let's get going. 30 is bid. Straight in at £30 bid. At £30. Advance if you like. all online. 42, 45 now. All done? You all finished at £45? Now, if Charles wants to get ahead, he needs his hat box to sell well. £20 I've got. 22 against you. Someone has got a hat with no box. Seated at £35. 38, anywhere? All done, then. All finished at 35. Ouch! Hats off to you for trying, though. Sorry I showed it to you, Charles. Now, only two lots to go. It's a battle of the silver. First, Charles' pair of vases and the silver ingot. It's a maiden bid. Any advances? 5, 90, 5, 100 now. All done, then? All finished. £5 isn't to be sniffed at in this game. -I think that was a good price. We've come out with our heads held high from that one. Geraldine and Will's Chinese silver box. Straight in at £60. 65, 70 is bid. Against you, sir. 85, 90 is bid. At £90 on the commission. -We're going out with a bang. -Online coming in at 95. 100, back on the commission, is with me. At £100. 110 is bid. 140 is back with me, commission bid. I don't feel completely useless any more. 170. Commission bids are out. All done, then? All finished at £170. The big finale has brought the house down. That might have got us out of trouble. Excellent. I think it has got you out of trouble with a vengeance. I'd say that is the perfect way to end this auction. made after saleroom fees a profit of £89.69. with all profits going to Children In Need. -Oh, it's been such a pleasure. A standing ovation sees our marvellous players off. Bravo! Thank you, it's been great. 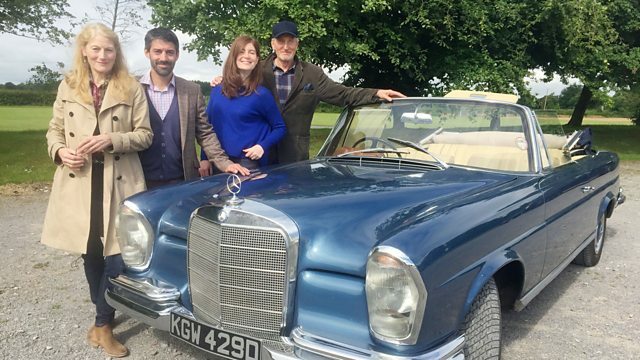 Legends of stage and screen Charles Dance and Geraldine James join antiques experts Natasha Raskin and Will Axon on this road trip romp around Wiltshire. Charles finds a pair of Edwardian silver vases he hopes will prove profitable at an auction in Essex. Geraldine, however, bumps into a chap in the street with a 19th-century French empire secretaire. It costs her a small fortune - will the gamble pay off? A diversion from the shops sees Charles end up in the cockpit of a very old helicopter, while Geraldine learns how a small part of Swindon dating back 170 years influenced the creation of the modern NHS.